Congratulations, Your Majesty, on your Diamond Jubilee. Long Live the Queen. Hello and welcome to Bootleggers Buzz issue #16, for the partially sighted and the slow-minded I can tell you it's a special edition to celebrate the Queen of the United Kingdom's Diamond Jubilee, having been Queen for 60 years. There are 1,000 boat floatillas going down the Thames, concerts outside Buckingham Palace, and street parties all around the country but I know that this will be the pinnacle of the celebrations. Afty then asked a few players who they would choose to be their monarch if they had the choice; and to balance up this overwhelmingly positive reflection of the Queen, ShyGuy asks whether a Royal Family are really neccecary. Finally, we have another contest! We're getting bloody generous recently! All you have to do is answer a few simple questions, solve a simple maths problem and submit it to the simple contest site! 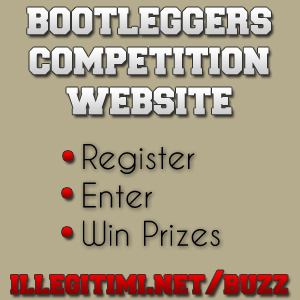 Remember that when you sign up to the contest site you need to use your current Bootleggers username in order to be verified! Enough Jubilee celebration. We also bring you the standard news of the week, including the wipe of The Enterprise and the suspiciously timed return of Event Horizon, the wipe of Carpe Diem and some of our regular weeklies including Afty's TV Rip-Offs and A Few Harmless Questions from powerbear. I hope you enjoy the read and I'm proud to say that by both UK time (with minutes to spare), and definitely by Bootleggers time- this is still a morning edition. On Saturday June 2nd 2012, The Enterprise got wiped. A minute later Event Horizon was back on the stats. Is this war a never ending story? ShyGuy investigates. Afty's ever amusing TV Rip Offs continue with Room 101. A list of all the players killed this week, ranked Boss+. RIP to all. This bank holiday weekend, the Queen of the United Kindom, Queen Elizabeth II celebrates her Diamond Jubilee, meaning she has been Queen for 60 years. We at the Buzz wondered what Bootleggers might be like in 60 years time, and came up with a few suggestions. Afty asks a few Bootleggers players who they would have as their Head of State and Monarch, if they had the choice! On Friday night, just before the doors of the Buzz office close, The Buzz heard a firefight. When we arrived at the crime scene we only saw dead Carpe Diem members lying on the ground, but no shooter. The Buzz went to investigate! powerbear continues to ask his few harmless questions; a claim that was refuted this week by someone in the Game Forum saying they hurt their finger on the keyboard while typing! Oh well! The Game Statistics as they stand now, and compared to a week ago. We're always looking for ways to improve this, so please send in any suggestions. We at the Buzz had a think about who on Bootleggers would fill the places of the Royal Family and here's what we came up with. Who do you think? In this Monarchistic edition of the Buzz, and on the Queen's Diamond Jubilee weekend, ShyGuy dares to challenge the existence of the Royal Family! To the tower with him! It's contest time again here at the Buzz, and we're keeping in theme with a Jubilee related puzzle. A small amount of mathematical ability, an extensive knowledge of the Royal Family (or access to Google) and a little bit of guess work will all be needed for this one! I still have literally no idea what RatFaceRay is going on about. At least he's consistent!